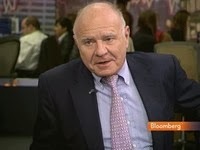 Year 2015 will be marked by volatility and surprises one considers Marc Faber, author of the newsletter for investors "Gloom, Boom & Doom Report" and the best option is the capital conservation diversification. In a response to Bloomberg TV Swiss investor resident in Thailand recalled that last year was a bad one for active portfolio managers, 90 fund managers reporting of underperforming the main index of the American Stock Exchange, the S & P500. In this context it is remarkable, however, that a higher yield was obtained from the average market fund "all seasons" of Bridgewater Associates built exactly on the principle of diversification between stocks and bonds.